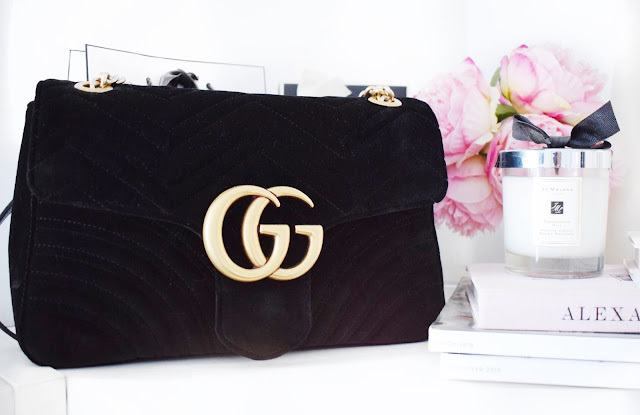 Today's blog post is going to be a special one because I am going to talk about my new baby, the Gucci Marmont bag. I decided to treat myself to this special little bag after the New Year because I felt like I deserved a treat. Granted, with our engagement, planning a wedding and buying a house, I should really knock the expensive handbags on the head, but this one as calling my name. I felt like my collection was really lacking in a standard black bag that I can take out and about with me. I have some larger black bags, but I didn’t have a good quality black bag for more dressy occasions and that is what this bag is! When the Gucci Marmont line first came out, I have to admit that I didn’t really love them. I loved the overall look and style of the bag, but I didn’t like how it looked in the leather. When I would see bloggers with this over on Instagram, I always thought that the shiny leather always looked a little cheap, which I know it is not, but it just wasn’t my cup of tea. So, when I saw this on the Far Fetch website in the velvet, I knew that this was going to be the bag for me. Since picking up this beauty, I have used it so much because in my opinion, this really is the most perfect winter time bag and that is why I have been getting so much use out of it recently. Firstly, I have to talk about the overall appearance of this handbag. The shape is just the most perfect size for me to fit all of my day to day items inside. I did get the larger size, purely for the fact that you get more bag for your money and that means that it is more versatile for me. I would never buy a bag that I can barely even fit my wallet inside, so this bag is just perfect. I have gone about my day with everything in this and it still looks just as beautiful and it holds all of my everyday essentials with ease like my makeup bag, phone, wallet and keys. Size wise, I would say that this bag really is one of my favourites from my collection because it is just amazing and everything that I have been looking for. I just really think that this is the most perfect handbag and it has filled a gap in my collection. I never thought that I would be the proud owner of a Gucci bag, simply because nothing really appealed to me that much until I got my hands on this stunning item. I always get so many compliments on this item whenever I wear it because it is just so stunning with the black velvet and the contrasting gold hardware. I am so happy that I bought this bag and I would be very happy to purchase this again. I think this set me back around £1450, but I think that is a very fair price for a bag of this stunning quality. Make sure to leave me a comment down below and let me know if you are a fan of Gucci and if you have got your hands on any of their stunning items! This bag is such a statement. I am just so in love with this item! I absolutely am a Gucci fan, this last Xmas I got the Soho disco bag and I totally love it!! The Soho Disco handbag is such a stunning item! I am so glad that I went for the velvet and not the leather! I am so happy that I went ahead and picked it up! It is just the most perfect black bag! This is such a gorgeous bag and I totally agree, it looks much nicer and more expensive in the velvet than the leather! I know it is all personal preference, but I adore the velvet! Oh this bag looks really gorgeous! I feel like it is my best handbag purchase! Congratulations on your baby "Gucci". You made a nice choice. I am so in love with this handbag, I feel like I made a good choice! It is just such a stunning and timeless item! This bag is so stunning! I agree - the quality is definitely worth the price. I don't own a Gucci bag, but I think I'd love this one if I did! I have got so much use out of this handbag recently! I totally get where you are coming from lovely! I just love how classic this looks! I am so in love with it, more than happy with my purchase! It is lovely to do it every now and again! I love the black velvet with contrasting gold hardware, so chi & easy to wear day & night. I am so glad that I got my hands on this stunning handbag!